"Homage to a Poet", London, National Gallery, panel, 59x48 cm. In 1885 London's National Gallery acquired a painting, now entitled, "Homage to a Poet," that was originally thought to have been done by Raphael. 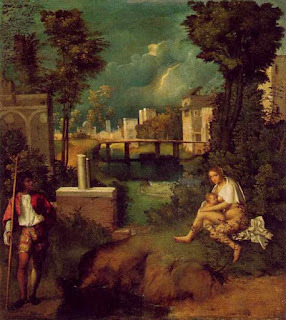 Subsequently, scholars tended to give it to Giorgione but now the Museum claims that it was by a "follower of Giorgione," although it mentions a more recent view. The major figure in the painting is a man with a sorrowful expression on his face, with a flowing golden robe, and a laurel wreath on his head. The man is seated on a kind of throne with two young men paying him homage. Another young man sits on a step playing a lute. In the foreground on the other side of the painting are a leopard and a peacock. 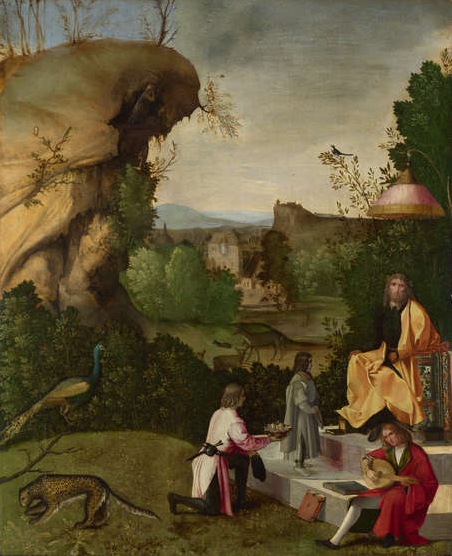 All the figures are in a Giorgionesque landscape which includes an indistinct figure in the rocky outcrop on the left. In his 2009 monumental study of Giorgione, Enrico Maria dal Pozzolo claimed that the painting might be the earliest Giorgione still extant. Dal Pozzolo made note of the different attributions as well as the varying interpretations of this mysterious painting. He then offered his own unique interpretation. 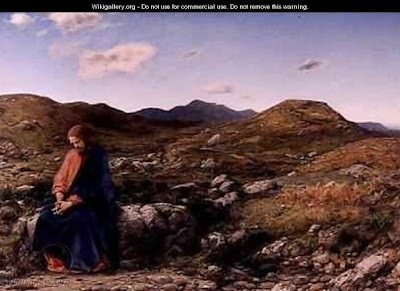 In 2007 Wolfgang Eller declined to attribute the painting to Giorgione, although he did admit that Giorgione might have done the landscape. His opinion was based on stylistic grounds. Eller declined to suggest an interpretation. 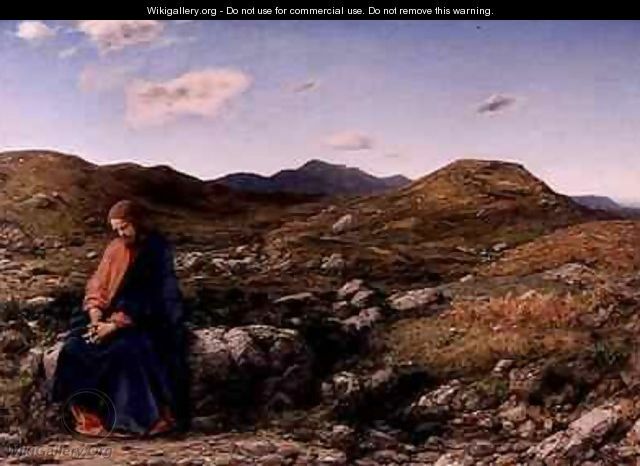 In 1999 Teriseo Pignatti and Filippo Pedrocco gave the painting to Giorgione also on stylistic grounds. They also called the painting mysterious and mentioned the many attempts at interpretation but without coming to any conclusion. **Dal Pozzolo, Enrico Maria: Giorgione, Milan, 2009. ***Eller, Wolfgang:, Giorgione, Catalog Raisonne, 2007, p.124. #Pignatti, Teriseo and Pedrocco, Filippo: Giorgione, NY, 1999. Catalog entry #5. The Anonimo, Notes on Pictures and Works of Art in Italy made by an Anonymous Writer in the Sixteenth Century: ed. By George C. Williamson, London, 1903. The Bible of the Poor, (Biblia Pauperum), a Facsimile and Edition of the British Library Blockbook C. 9 d. 2, translation and commentary by Albert C. Labriola and John W. Smeltz, Pittsburgh, 1990. Bembo, Pietro: History of Venice, edited and translated by Robert W. Ulery, Jr.,Cambridge, MA, 2008, vol. 2, books v-viii (1499-1509). Brown, David Alan, Leonardo Da Vinci, Origins of a Genius, Yale, 1998. Brown, David Alan, and Ferino-Pagden, Sylvia, Bellini, Giorgione, Titian, and the Renaissance of Venetian Painting, Washington, 2006. Campbell, Stephen J: “Giorgione’s Tempest, Studiolo Culture, and the Renaissance Lucretius,” Renaissance Quarterly, 56 (2003) 299-332. Cartwright, Julia, Isabella D’Este, Marchioness of Mantua, 1474-1539, London, 1932. Christiansen, Keith: “Giovanni Bellini and the Practice of Devotional Painting,” in Giovanni Bellini and the Art of Devotion, Indianapolis, 2004. Colonna, Francesco, Hypnerotomachia Poliphili, The Strife of Love in a Dream. The entire test translated for the first time into English with an introduction by Joscelyn Godwin, New York, 1999. Dal Pozzolo, Enrico Maria: Giorgione, Milan, 2009. Ekserdjian, David: Correggio, Yale, 1997. Eller, Wolfgang: Giorgione Catalog Raisonne, Petersberg, 2007. Ferino-Pagden, Sylvia, and Nepi-Scire, Giovanna: exh. Cat. Giorgione, Myth and Enigma, Vienna, 2004. Filas, Francis L., Joseph: The Man Closest to Jesus, The Complete Life, Theology and Devotional History of St. Joseph, Boston, 1962. Fleming, John V. From Bonaventure to Bellini, an Essay in Franciscan Exegesis, Princeton, 1982. Gilbert, Creighton E.: How Fra Angelico and Signorelli Saw the End of the World, Penn State, 2003. Goffen, Rona: Piety and Patronage in Renaissance Venice, Yale, 1986. The Grimani Breviary: Levenger Press, DelRay Beach, Florida, 2007. Hall, Marcia: Color and Meaning, Practice and Theory in Renaissance Painting, Cambridge, 1992. Hennecke, Edgar: New Testament Apocrypha, ed. By Wilhelm Schneemelcher, Volume One, Gospels and Related Writings, Philadelphia,1963. 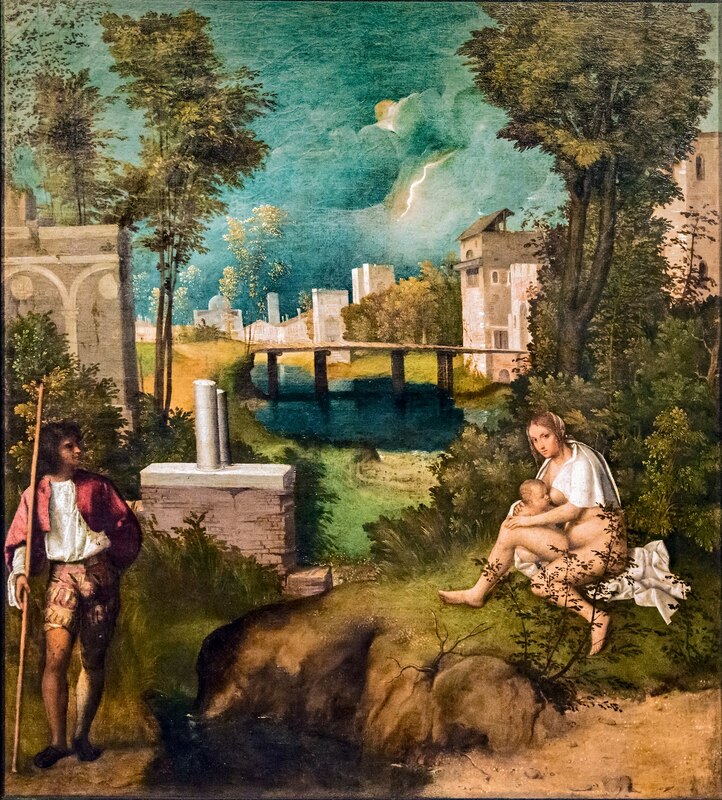 Holberton, Paul: Giorgione’s Tempest or ‘little landscape with the storm with the gypsy’: more on the gypsy, and a reassessment,” Art History, Vol. 18, No. 3, September 1995, pp. 383-404. Humfrey, Peter: Painting in Renaissance Venice, Yale, 1993. Humfrey, Peter: Titian, London, 2007. Howard, Deborah: “Giorgione’s Tempesta and Titian’s Assunta in the Context of the Cambrai Wars, Art History, Vol. 8, No. 3, September 1985, pp. 271-289. Hutton, Edward: Venice and Venetia, NY, 1911. Impelluso, Lucia: Nature and Its Symbols, translated by Stephen Sartarelli,Los Angeles, 2003. Jameson Mrs. Anna: Legends of the Madonna, Boston, 1885. Joannides, Paul: Titian to 1518, the Assumption of Genius, Yale, 2001. Kaplan, Paul H.D. : “The Storm of War: The Paduan Key to Giorgione’s Tempesta,” Art History, Vol. 9, No. 4, December, 1986. Kasl, Ronda ed. : Giovanni Bellini and the Art of Devotion, Indianapolis, 2004. King, Margaret L.: Venetian Humanism in an Age of Patrician Dominance, Princeton, 1986. Lugli, Emanuele: Between Form and Representation: the Frick St. Francis.” Art History, Vol. 32, No. 1—February 2009, pp. 21-51. Male, Emile: Religious Art in France, The Late Middle Ages: A Study of Medieval Iconography and Its Sources, Princeton, 1986. Male, Emile: Religious Art in France, The Thirteenth Century, Princeton, 1986. Norwich, John Julius: A History of Venice, NY, 1982. O’Connor, Edward Dennis, ed. : The Dogma of the Immaculate Conception, History and Significance, Notre Dame, 1958. Pignatti, Terisio and Pedrocco, Filippo: Giorgione, Rizzoli, NY, 1999. Rapp, Jurgen: “The ‘Favola’ in Giorgione’s Tempesta,” Giorgione, Myth and Enigma, 119-123. Ridolfi, Carlo: The Life of Titian, ed. Julia Conway Bondanella and Peter Bondanella, Bruce Cole, and Jody Robin Shiffman, Penn State, 1996. Rosand, David: Painting in Cinquecento Venice: Titian, Veronese, Tintoreto, Yale, 1982. 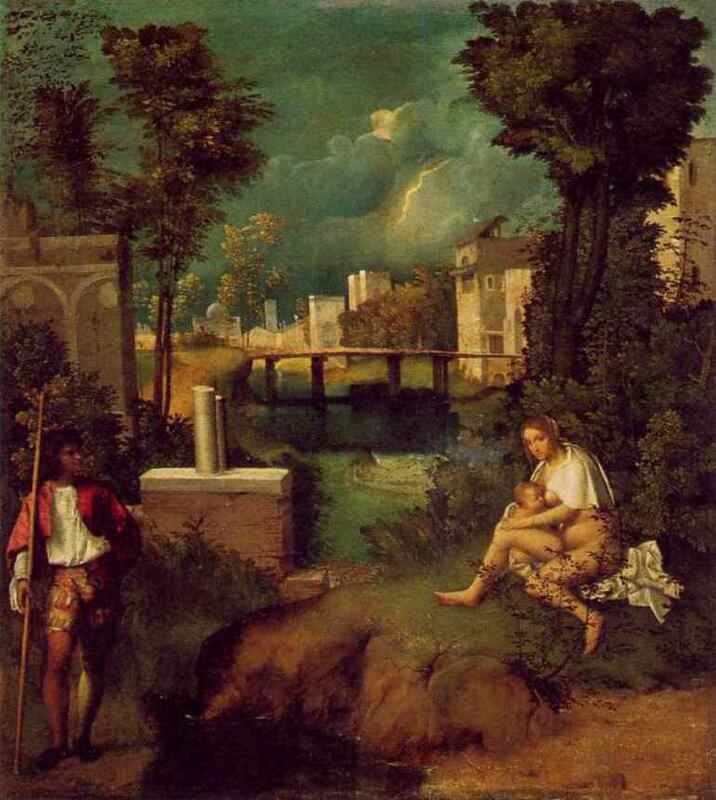 Schier, Rudolf: “Giorgione’s Tempesta, a Virgilian pastoral,” Renaissance Studies, 22 (May 2008), issue 4, 476-506. Schwartz, Sheila: “The Iconography of the Rest on the Flight into Egypt,” unpublished doctoral dissertation, NYU, 1975. Settis, Salvatore: Giorgione’s Tempesta, Chicago, 1990. Steinberg, Leo: Leonardo’s Incessant Last Supper, New York, 2001. Steinberg, Leo: The Sexuality of Christ in Renaissance Art and in Modern Oblivion, NY,1983. Wilson, Carolyn: St. Joseph in Italian Renaissance Society and Art, Philadelphia, 2001. Wind, Edgar: Giorgione’s Tempesta, Oxford, 1969. Wind, Edgar: Pagan Mysteries of the Renaissance, New Haven, 1958. Titian: "Sacred and Profane Love" Bibliography. Cleugh, James: The Divine Aretino, NY,1966. Goffen, Rona: Titian’s Sacred and Profane Love and Marriage, The Expanding Discourse, Feminism and Art History, ed. Norma Broude and Mary D. Garrard, NY, 1992. Pp. 111-125. Goffen, Rona: Titian’s Sacred and Profane Love: Individuality and Sexuality in a Renaissance Marriage Picture “ in Titian 500, ed. Joseph Manca, Washington, 1993. Goffen, Rona: Titian’s Women, Yale, 1997. Haskins, Susan: Mary Magdalen, Myth and Metaphor, NY, 1994. Hope, Charles: Titian, NY, 1980. Jansen, Katherine Ludwig: The Making of the Magdalen, Preaching and Popular Devotion in the Later Middle Ages, Princeton, 2000. Joannides, Paul: Titian to 1518, Yale, 2001. Masson, Georgina: Courtesans of the Italian Renaissance, NY, 1971. Panofsky, Erwin: “The Neoplatonic Movement in Florence and North Italy (Bandinelli and Titian”, Studies in Iconology, NY, 1962. Pp. 129-171. Rosand, David: Titian, NY, 1978. Rowland, Ingrid: From Heaven to Arcadia, The Sacred and the Profane in the Renaissance, NY, 2005. Titian, catalogue edited by David Jaffe, London, 2003. *Copies of either bibliography will be sent to interested students upon request.